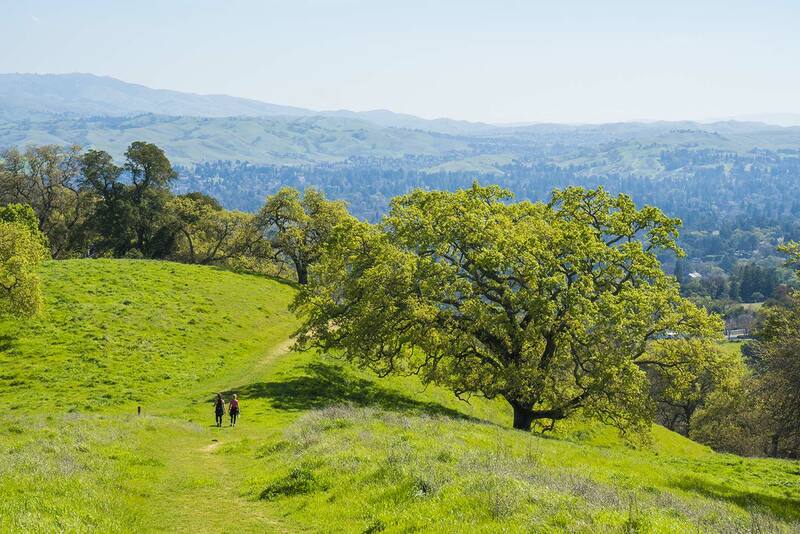 The Madrone Trail climbs through oak-dotted meadows. Click to see a similar view in summer. 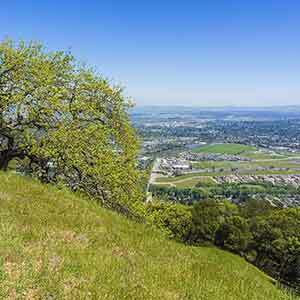 Eagle Peak itself is just a little rock perched on a minor ridge, but the climb to Eagle Peak is one of the finest hikes in the East Bay, mainly because the trail climbs through open, oak-dotted meadows with superb views of the San Ramon Valley. The enjoyability of this hike varies a lot, though; some years the park is over-grazed and just seems hot, dusty and worn-out. 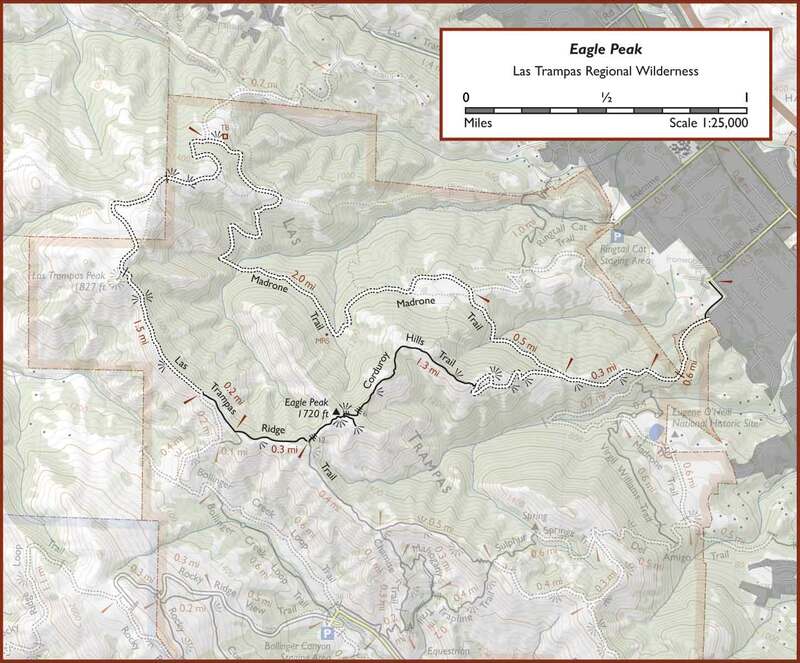 After reaching Eagle Peak, most people just turn around and return the same way, making a rather short 4.2-mile hike with 1430 feet of climbing, but I like to make a longer loop and return on the Madrone Trail. Especially in summer the rest of the loop isn’t as scenic as the initial climb, but it’s still really nice and makes the hike a lot more satisfying. The park is fairly popular and on a nice weekend when the grass is green you can expect to see a group every two or three minutes, mostly locals out for a short walk. Start at the end of Camille Avenue in Danville. There’s no parking lot, but it’s not usually a problem to park on the street. The hike gets off to a great start, following a little road along an old orchard at the edge of Danville, one of the Bay Area’s nicer (and wealthier) suburbs. The sound of chirping birds fills the orchard. 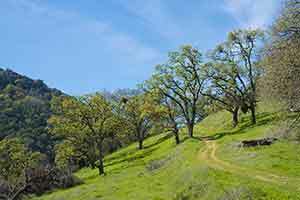 Turning into the park, the trail begins a steep climb, soon entering an open and very attractive blue oak grove. The small to medium-sized trees grow out of a grassy lawn with little understory. Soon the trail emerges into an oak-dotted meadow. 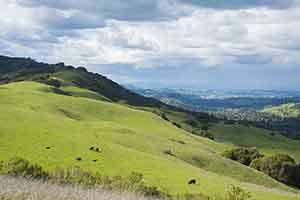 As the trail continues to climb steeply, increasingly scenic views of suburban Danville and the San Ramon Valley open up. 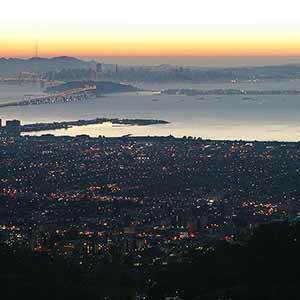 The distant whooshing sound of traffic from Highway 680 can be heard. 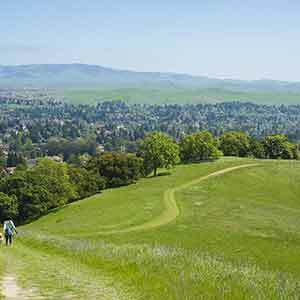 The Corduroy Hills Trail has some great views of Danville. Click to see a similar view in summer. The dirt road ends in a little loop and gives way to a narrow singletrack that almost immediately plunges into live oak woods. Like all of Las Trampas’ singletrack trails, it’s narrow, steep, rough, and overgrown. In this case, though, that actually makes it more enjoyable; as it winds along a ridge through dense woods, you never really know what it’s going to do next. It feels like a secret path through the woods. 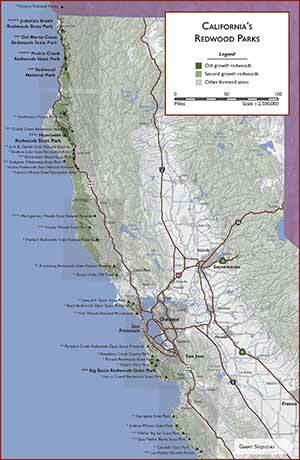 There’s poison oak along the trail but it’s easy to avoid. 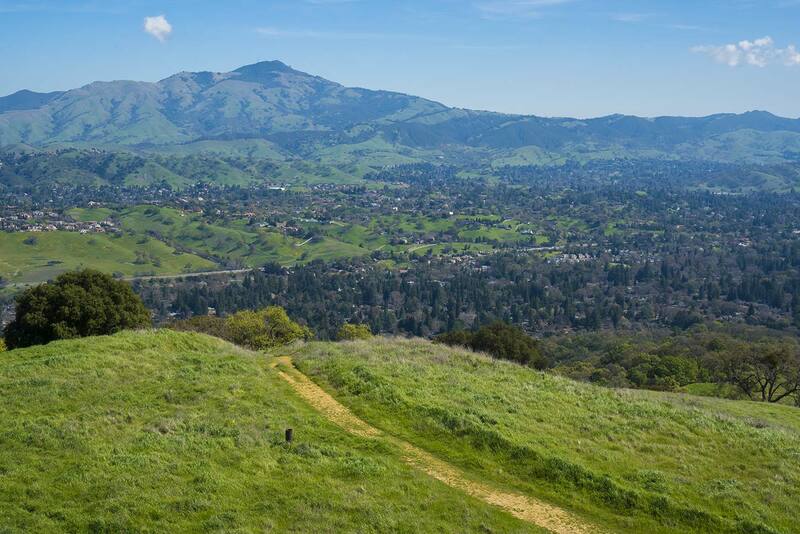 Reaching Eagle Peak, there’s a short side trail to a nice view of Mount Diablo. 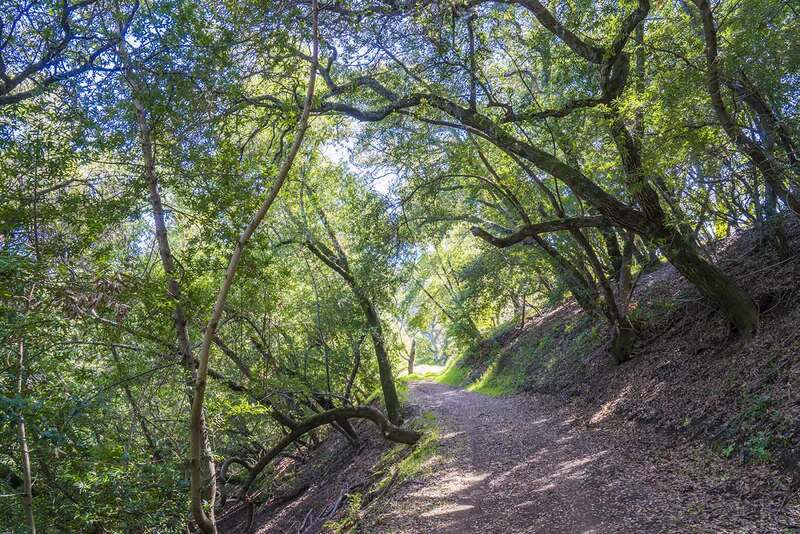 There’s a steep but short descent off the ridge, then the trail climbs again through oak woods. 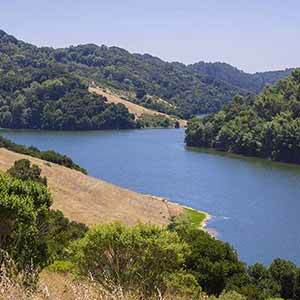 The last few yards are especially steep and can be infested with poison oak. This area can get unpleasantly muddy after it rains; there are some steps but they’re almost completely eroded away. 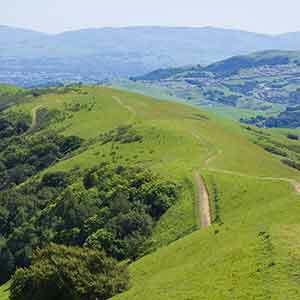 The trail reaches the Las Trampas Ridge Trail. This wooded singletrack is heavily used and actually in pretty decent condition, but not especially interesting. The trail joins a dirt road and emerges into sunny scrub. 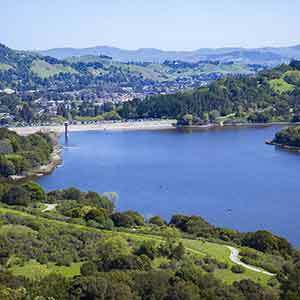 In summer this area can be unpleasantly hot and dry. 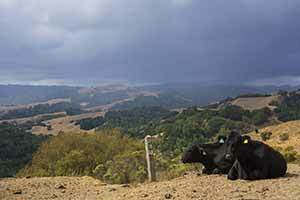 There’s a little side trail to the underwhelming Las Trampas Peak; the view from the peak isn’t really worth the detour, since it’s not much better than the views from the trail. 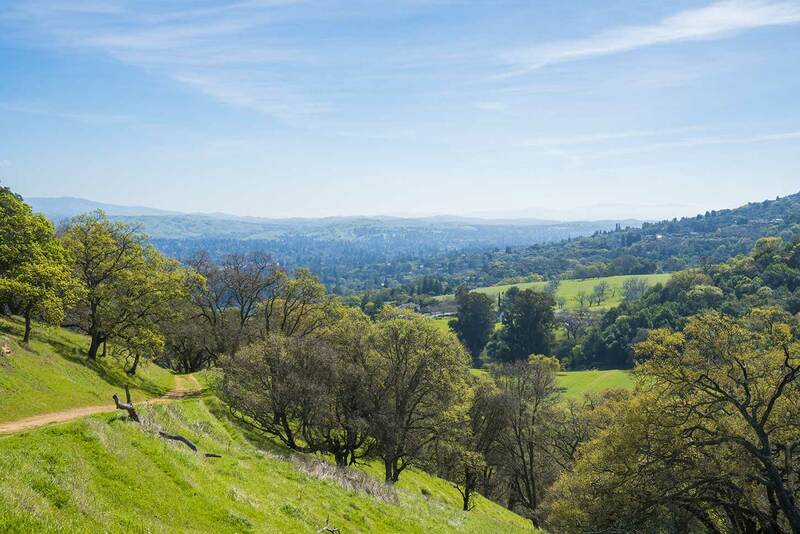 Past the peak, the main trail descends gently through a large, open cow pasture with sweeping views of Walnut Creek to the north. 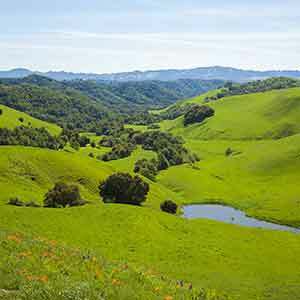 The pasture is quite scenic in spring, but is often over-grazed and unattractive in the summer. 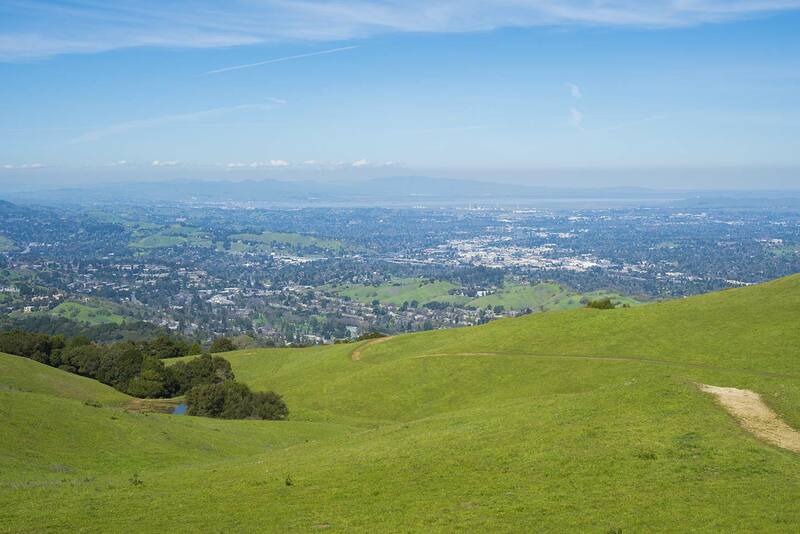 The trail continues to descend, offering great views of the San Ramon Valley. 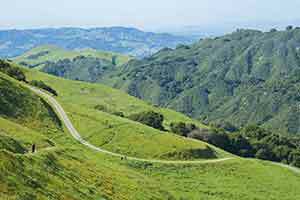 Passing the unmarked intersection with the Las Trampas-to-Briones Trail, the road enters a mixed woodland. 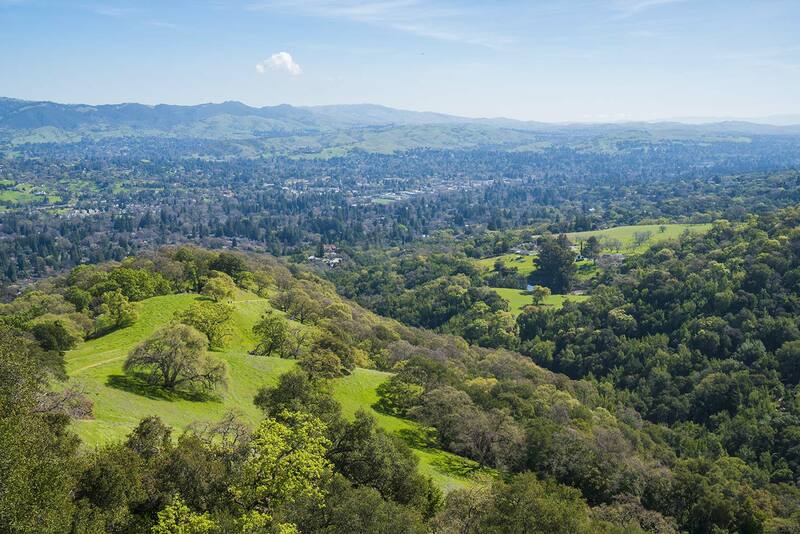 Typically for the East Bay, the woods are mostly dark, dense live oaks interspersed with deeply shady stands of laurels in the gullies; it’s nice but not really anything special. There are still some ups and downs as the trail descends into and then climbs out of a large, rugged valley, but this is still one of the easier sections of what’s otherwise a fairly slow and challenging hike. 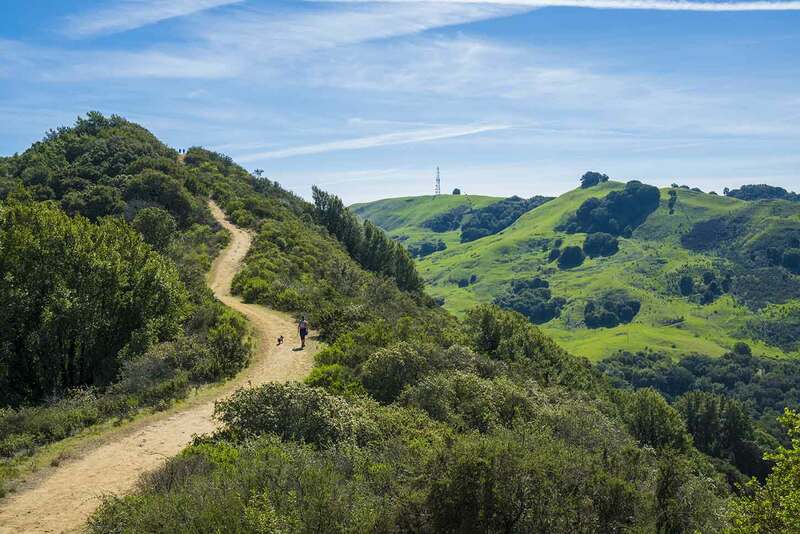 The scenery abruptly changes back to the much more attractive blue oak meadows right at the end of the loop, at the intersection with the Corduroy Hills Trail.